Hi there sugar dolls! I was totally not planning on posting tonight... and then I got home earlier than planned and, well, I couldn't keep myself from doing so. Oh well! Hope you've had a great week so far. Considering the many serious tones running through yesterday's post, I've decided to focus on lighter things tonight. You have been forewarned ;). A couple of weeks ago, I had the pleasure of meeting David for lunch before he left for Colombia. We met at the Nolita House, a restaurant/bar not too far from my office nor from his brother's apartment and one that I've actually been to twice, both times without a camera. As NY Mag describes, the Nolita house neither "aspires to Soho House's level of sophisticated debauchery" nor "mocks it", it is a rustic casual New American spot with artisanal cheese plates, reasonably-priced happy hour tacos, and scholastic-themed cocktails. Sounds intriguing, I know. Tell us 10 little known facts about yourself and then pass it on to 3 to 5 other bloggers... okay then! I sleep with a skunk, his name is Stinky, and he is Pepé Le Pew's cousin. On my 9th birthday, I remember sitting in the living room at my old house opening my family gifts before I left for school. My mom leaned over and whispered, "just pretend to like it, we can return it later," as I reached in the bag that my sister, then two years old, gave me and felt the stuffed animal skunk. From that night on, and through all the nights at home, Stinky's been with me. Please note that before then I'd never had a stuffed animal nor a "blankie" accompany me in my slumber. The only liquor I drink, and actually enjoy, is tequila. When I first began to drink alcohol socially I experimented with rum, vodka, and even whiskey. As the years have gone on, however, and my drinking has gotten more responsible, I prefer wine and beer among all others. If a shot must be had though, and let's face it that does happen sometimes, I'm a tequila and lime girl all the way. I like to think it's the Mexican in my blood. I am a despicable nail-biter. Ugh, this one is just gross, and I wish I wasn't guilty of it. To make matters worse, I'm pretty sure that I made myself get into the habit of biting my nails at age eleven when my cousin lived with my family for a summer. She's super cool and used to bite her nails. I, of course, have yet to grow out of it. A manicure helps though! I appreciate country music. I am not ashamed about it or anything, but around the area from where I'm from, such an appreciation is rare. When it comes to music though, I don't discriminate. At a young age, I was exposed to a lot of different kinds including classical, jazz, and country, and so I love it all, even though I am in no way, shape, or form a musical expert. I've been told I have a great voice, and I don't mean in the sense of singing. No, I have been complimented on the way my talking voice sounds. Is that not the oddest compliment you've ever heard? When I was in 6th grade, my language arts teacher actually suggested that I be on the radio or on television in my future career. Ha! The above fact is so funny because little did he know that I was and still am unreasonably insecure. Although not particularly extroverted, I usually make an effort to be friendly, smiley, and conversational. As such, I'm pretty sure that I come off as confident and if so, and I'm sad to admit this, most of it is mostly then for show. I'm working on this one though, promise. I hate shoe-shopping. And to be completely honest, I actually don't usually enjoy shopping either. I am a combination of an impulse buyer and one who needs to love, love, love something before even considering it. As such, the fact that I must try on shoes before purchasing a pair annoys me like none other. That's not to say that I don't like shoes, though, because I do, very, very much :) in addition to new clothes. I never liked bacon. Maybe this isn't a secret after all, but I find my distaste for the fried, fatty breakfast favorite a unique one. It's one of the things that non-veg-heads usually ask me if I miss when they find out that I don't usually eat meats and try to stick to a plant-based diet. Of course I don't miss it! I can't even stand the smell. I was once embarrassed by my naturally good posture. Apparently, my tendency to sit up straight comes from my maternal great grandmother, paired with years of dance, I'm sure. One day in middle school, a "friend" commented on how I sat at the lunch table, a comment which extended to the point of teasing. It's blows my mind that I then made a conscious effort to slouch for the next few weeks. Like Claire, I am bad at burping. I probably burp about two to three times a year and it's only induced with extreme carbonation. When I was more immature it used to bother me... now not so much :). Also, unlike her (I'm sure) and most other people, I don't know how to roll my R's nor roll my tongue. I'm convinced that my tongue is dumb. And now you "know" more about me then you ever could want, huh? Fun :). Feel free to comment below on any similar or completely dissimilar quirks that you yourself might possess. 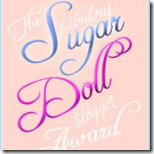 Or like the latest recipients of the Sugar Doll Blogger Award: Leslie, Kailey, Sofia, Jenn, and Holly, blog about them. Either way, with this photo of the surprisingly green/gorgeous dinner I was able to prepare from the cafeteria selection at my sister's sleep away camp, I will now bid you adieu. P.S. 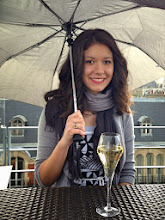 This is my 512th post, and I've been blogging for over two years. Oh how time flies! In celebration, I'm taking a blogcation :). I LOVED reading this... so fun! I also love me some country music - I love ALL music. I have been told I have a great speaking voice - that's funny! haha...this is so weird, but we have WAY MORE IN COMMON THAN I THOUGHT. i have also been told i have a pleasant speaking voice. i do not particularly enjoy shopping - totally buy on impulse, which results from LOVE LOVE LOVING something right away. i bite my nails like whoa. i am totes insecure underneath it all. annnddddd, as if that wasn't enough, the ONLY hard liquor i like is tequila. countdown to madison: 2 1/2 months!!!! Holly: My Madisonian soulmate, I cannot wait to meet! BroccoliHut: Thanks, love! Love our differences but I agree, I'm sure we have a lot, a lot, a lot in common. aw, i'm honored! my first award! crunchygranolagal: Yay congrats! Wowee, you did say it. What will they think of us now :) thanks for being wonderful! Cheers to Tequila. thank you SO much for the award, my dear. apologies for taking so long to actually say thank you - my internet service has been sketchy at best lately. leslie: My pleasure, sweetheart! Hold on one second though... are you saying that we have almost everything in common? No way ;) see you tm! Wow! You have been blogging a long time! I've only been at it a little over 6 months. It sure is addicting though. That burrito looks so good. I am on a huge Mexican food kick right now. Also, I love when bloggers share so openly. It makes me want to read more. I don't like people who pretend to have everything together. You are lovely! Tina: Oh that it is :) aw, thank you so much!